Imagine a future where cities are built on the remnants of the cities we know. Portland/Seattle/Vancouver have merged to become “Cascadia.” These meta cities transcend national boundaries and have cultures, alliances, and citizenships of their own, sometimes coming at the expense of the surrounding countryside that used to support their previous iterations. This is the world that John Scalzi and four other science fiction authors have imagined in Metatropolis. No longer are people American, or Canadian, or Chinese, or Swedish. Rather, they are part of the larger and pan-national metatropolis, or they are not. Citizens of, say, St. Louis, can travel without need for passport to Hong Kong or Stockholm or Cascadia. Travel to geographically nearby St. Charles, Missouri, is much more problematic. Technology has divided these green cities from the “wilds” surrounding them, and a private corporate police force (or other militia) enforces the separation of the people within from those without. 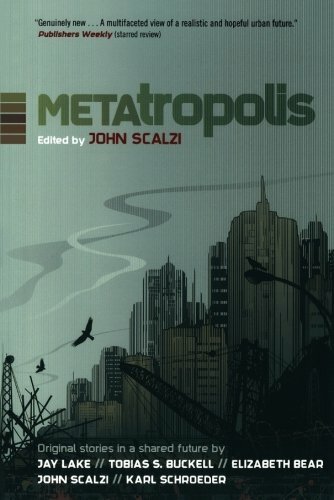 Metatropolis is an anthology, five stories by five authors, set in a single “world,” but very different in their approach. Jay Lake introduces us to Cascadia, structurally overlaid on the Pacific Northwest, struggling to both create a new utopia and escape from corporate and nationalistic interests that would bring it back to the carbon-using heritage it rejected. Lake’s “city” is both anarchic and rigid, both urban and agrarian, high-tech afraid to show up on the grid. Tobias S. Buckell writes of a Detroit that ultimately moves to reject cars. Elizabeth Bear also looks at Detroit, at a community within the community that finds trust and interdependence are essential to life in this new world. John Scalzi moves us to St. Louis, where placement exams determine your role within the city and refusal to conform means banishment to the wilds that have replaced former suburbs. And Karl Schroeder takes us to Europe and to a new, virtual reality that is looking to replace the metatropolis, perhaps at the expense of everyone not part of the experiment. Anthologies bring both strengths and weaknesses to a world. They bring different perspectives. None of the authors see the world (either ours or the one they’ve created) the same way, which creates both a fullness that would be impossible from a single writer and certain inconsistencies that would not be permissible in a tighter narrative. They are five distinct stories. It is possible they happen consecutively, but that is not required by the format nor spelled out within the narratives. There is no specific relationship between the stories, other than they all take place in the same general landscape. No characters move from one story to another. Even the two stories set in “Detroit” make no direct mention of each other, except for a brief and oblique reference in one to an event that occurred in the other. Frankly, were the stories not in the same book, I would not have necessarily recognized that they were set in the same world. Even the shared names (e.g., Cascadia) barely acknowledge any relationship among the stories. These are five solid individual stories, but their differences are more noticeable than their common heritage. Eyewitness testimony is notoriously unreliable in court. Having five writers tell us their vision of the same world gives us both larger picture and and occasionally a disjointed and even contradictory picture. It is not my usual cup of tea, but it makes for a nice change of pace from the usual novel.